Green I.It is unnerving that so far the biggest idea to solve the biggest problem is a colour. The China of the Future will once again be the Kingdom of Bicycles - Yung Ho Chang (i) The reason why this quote makes me lose my faith in the gentlement who uttered it is that I just saw four (4) Bentleys on the twenty-minute bike ride back from the office. Sure, it's the right neighborhood of Beijing to spot this particular brand, since a Bentley dealership just opened in Sanlitun, but these were seen far away from it and I also saw a Ferrari passing a Maserati (in between Bentley number 3 and 4). I don't think I need to mention all the A8s, Mercedes Geländewagens, few Porsches and the mat-lacquered BMW convertibles which crossed my path. But more interestingly, just as I came out from the office in Chaowai SOHO looking around for my old Flying Pigeon, I heard a high-pitch roar and turned around to see an Audi R8, in polished aluminium finish (basically only a handful of these exist on the planet) swirling out on to the driveway. When I was a child, from an age so early I don't have memories from to about 12, I was obsessed with cars. I could spot a Mitsubishi, a Citroen or even a rarity like Lancia from more than a hundred meters distance even before I could even say my own surname. Towards the final years of primary school, I started to hide it from my friends and classates since I was embarrassed to be interested in something so...mineral. I did go to the school discos and occassionally talked to girls but once a month when the latest edition of "Teknikens Värld" dropped down into the mailbox, I would dive into it and absorb every single technical specification, learning by heart the no of horsepowers of mundane saloons like Peugeuot 605 as well as super-sports cars that weren't even sold in my small Scandinavian homeland. I would digest every word of every virgin test drive and even chronicles about family life and the MGB club's trips to Jersey. But again, after a certain age this fascination with the motorized world ceased, and I could move on to other, more important things like architecture, stopping on the way at Nirvana and flanell-shirts, Stussy jeans and Ice Cube, Graffiti, Skateboarding, Wu-Tang, Tommy Hilfiger, and finally German techno (which I still occassionally go out to enjoy). Of course, it was hard to rid myself of my past passion and I still have a habit of remembering the new car models when they hit the streets. If I had seen a one-in-a-billion Audi, four Bentleys, one Maserati and one Ferrari in the course of 20 minutes as an 8-year-old, I would probably have thought I was dreaming. Now I just feel sick. I feel sick because I am in China and nowhere should you see so many ridiculously expensive cars in such short time frame but at a car salon, in Geneva, Frankfurt, Paris Detroit or Tokyo. Maybe even Beijing Car Show. But not on a Tuesday night at 9.15 in a developing country. This place seems just sprawling with people who don't know what to do with all their piles of cash (yes, they do still use cash in China, for obvious reasons, and in huge amounts since the largest bill is 100RMB). And all they seem to have forgotten what it's like to ride on a bicycle, for never have I seen such egoistic drivers as here. Never ever do they stop until they are centimeters away from hitting you. Their automobiles are constantly in motion, as if they thought the engine would stop if they did (which is probably the case wth the first Chinese-made cars that were rolling on the roads). And as if to celebrate this fact, they never want to turn them off. I've gone through parking lots outside shopping malls where many of the cars were idling just to keep the AC on until the owners came out again several hours later! Not to get too deep into it here, but I feel this topic is so loaded with political, economic and consumption ideals that it deserves to be studied, in facts and without judgement. I want to understand, both how this could become such a common way of unloading heavy wallets, and a symbol of China's growth and rise as a global power. How did the world's biggest bicycle-city become the world's biggest car-city in one generation? It's now been two days since we drew our last screws into the two projects that became the product of the ITERATE workshop. The first thing I want to do is to thank our dedicated students Song Yating, Zhai Jingyang, Wu Yulun and Yangyang Seunghee. Without their adventurous choice of joining this speculative workshop, it would not have taken place. The fact that we had a group of students pushed us to do our homework and prepare a rigorous theoretical framework for our exploration, presenting a wide range of precedents and references from many different fields. The point being that we are operating in a field that crosses over to many other disciplines, and the two pieces that came out of the workshop also constitute an ambiguous result in terms of definition. Defining what it is we made is perhaps not the most important issue here, but it still one of the crucial points of criticism that we are now facing. Early Sunday morning I received a phone call from our landlord saying that a group of neighbours had gathered in the courtyard in protest of the installation of sticks and string designed by student Yangyang Seunghee. The problem was not only that we had failed to inform all the neighbours in the courtyard behind, but also that these suspended objects were hanging at a height where you would have to crouch down to avoid collision, creating an especially precarious condition because of the lack of lighting during night time. In a different context though, this installation might have been understood as a temporary artwork which could be spared a few hours of existence, but in the context of one of the few remaining preserved Beijing courtyards, it was seen by the local retired residents as a threat to their security and therefore must be taken down. To make it simple, we were naive towards our neighbours' capacity to accept a temporary piece which would force them to take a different route, and they were perhaps overly dramatic in their reactions against this alien object. Nevertheless, it is worth reflecting on the consequences and how they could have been avoided. Which leads me back to the main topic; the content of our exploration and conclusions which can be drawn from it. There was a series of underlying notions in the formulation of the framework this workshop, and by extension in the research project that now has started. From my own side, I would like to stress the ideological aspect of our project: Addressing the prevailing issue of the credibility of our contemporary consumer society. The workshop addresses this issue in two direct ways: By limiting our source of material to used or discarded matter, things that would have been disposed of in landfills or incinerated, we would not impose unnecessary pressure to the environment for the purpose of developing a specific new knowledge. The fact that these objects have unique variations in terms of form, colour and texture as well as possessing their own latent history, make them all the more gratifying to work with. In addition, we explored the social aspect of how these objects can be retrieved and harvested in the specific context of Beijing's old city. The second point is the fact that the tool we used in the reconfiguration/design of these materials, Processing, is a free, open-source software and coding language. This of course means that while you as a designer first have to design and customize your tool in order for it to become efficient, it also brings a lot of advantages. During the past two weeks we only scratched the surface of the possibilities offered by using this environment, but the future process will be directed towards developing and streamlining the code to our use. Another major aspect is of course that of using our abilities as designers to propose and speculate on solutions for local and global issues. This aspect of the workshop is perhaps where we failed. Despite an ambitious level of research in the way some materials are used and how they are instrumental in the accretion of small reclaimed spaces in the hutongs of Beijing, the connection between our design process and these issues became increasingly blurred in the second week. In many ways, it is just as important to learn new tools as to be critical to them while they are being applied. With better planning and stronger focus for the Processing classes, we would probably have come further in the form explorations on an earlier stage, giving more time to establish a solid relationship between our materials and the environment in which they were found. To resume to our mission statement, we wanted to explore the intersection between design, computation and public space. By designing without specificity in neither user nor site and erecting the pieces in a sheltered, semi-private courtyard we not only avoided confrontation with the public, but projected an sense of arrogance towards the local community. Instead of allowing our neighbours and our initiated friends from outside to meet inside a common fascination for our research, and despite good intentions, the works provoked a sense of alienation from the point of view of our neighbours. To conclude, I would like to see this experience as part of an ongoing process, in which we tap into a wide range of material flows in the city, in production processes and socio-economic systems and reformulate unwanted output into operational synergies. In other words, turning waste, in whatever scale, into desirable matter. The work of German duo Köbberling Kaltwasser address a very contemporary issue with sophisticated social criticism and humour. 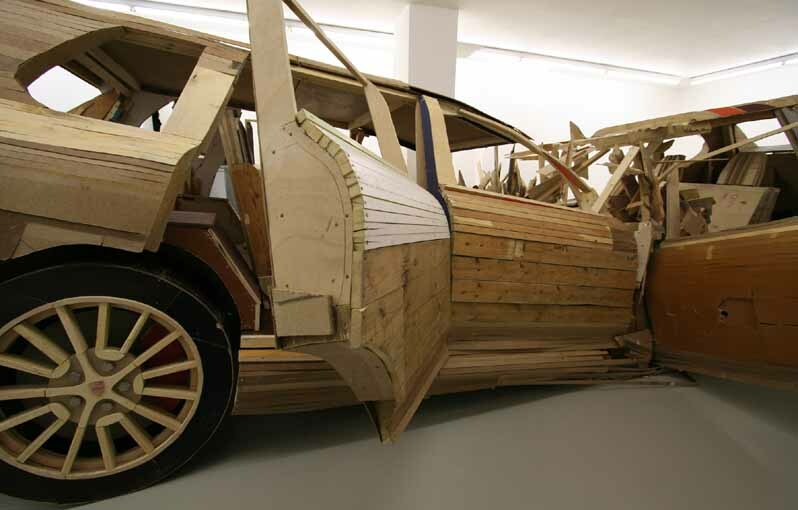 Through their remodeling of redundant commodities: turning scrapped cars into bicycles, raising self-made pavilions from debris on empty lots in Berlin, and building a temporary theatre out of disused woodboards and pallets, they are seemingly interested in the processes of consumtion and its environmental impact. But this is not an idealist practice with a "save-the-world" approach. The issues they address also reach beyond the idea of reuse. As an artist-architect couple, Folke Köbberling and Martin Kaltwasser also deal with sensitive ideological aspects of their own native country of Germany. By building full-scale models of Audi and Porche SUV's, they are poking at something deeply embedded in the identity of the engineered German society: Despite its ability to solve serious problems, most of the engineering ingenuity goes into creating advanced metal monsters for consumption with giant's appetite for fossil fuels, eating up valuable land in our cities. Built on a green area of the Martin Gropius Bau premises in Berlin, the Musterhaus (Model House) is a one-family prefab model house. In its cube shape it rather resembles the T-Com House, a hightech house which a manufacturer of prefabricated houses has put on show in central Berlin to advertise the delights of suburban life. In contrast to this, we have made the Musterhaus from materials that are widely available on Berlin’s streets, disused lots and building sites: bulky scrap, used materials, random finds and construction waste. We put these production cycle rejects to new use and imitate the cultural technique of direct, sustainable, user-based recycling which is primarily practiced in the southern hemisphere. The Musterhaus brings the globally prevalent concept of informal building, which has also characterised the recent urban development of Istanbul, to the heart of central Berlin. The Musterhaus, just a stone’s throw from Potsdamer Platz, forms a marked contrast to the Berlin monoculture of block buildings and the rigid plans for the city’s urban development. Built from locally sourced discarded materials by 100 volounteers during the summer of 2012, the Jellyfish was used as a theatre for the Red Room Theatre Company. Seating 120 and featuring a lounge, dressing corridor and backstage area, the creation also created quite a lot of PR for the theatre, igniting discussions about the Themes South Bank area in which it was placed.